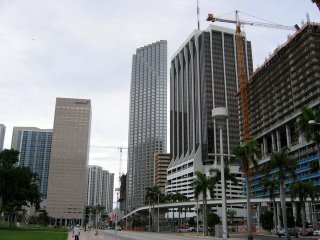 This is a shot of the southernmost part of Downtown Miami, looking towards the Brickell financial district. The track is for the Miami Metromover, a series of three Downtown-area automated minitrains, which I'll show you in the coming days (including a short ride). As you can see there's a lot of construction going on (both Downtown and in Miami in general) as city planners try to make Downtown a thriving area beyond the 9-to-5 crowd. What I like about this particular shot is that it makes Miami look like a proper modern city, even if only for a few blocks. All cities are beginning to look the same. Yes and no. The Downtown/Financial area for sure, but then there's the specific qualities inherent to each city. Though, as much as I actually love Miami, for my money, Paris and Venice go to the very top of the list.